Instructions are presented the same way as in paper/pencils assessments. Quickly capture client responses, including repeats. You will be alerted with time has elapsed. TMT applies the process approach to the assessment of cognitive flexibility. The TMT differentiates deficits in visual scanning, mental sequencing, and motor speed/control from deficits in cognitive flexibility and control. The TMT consists of 5 trials, visual scanning, number sequencing, letter sequencing, number-letter switching, and motor speed. The examinee completes this test using the traditional response booklets, and not on his or her digital device. 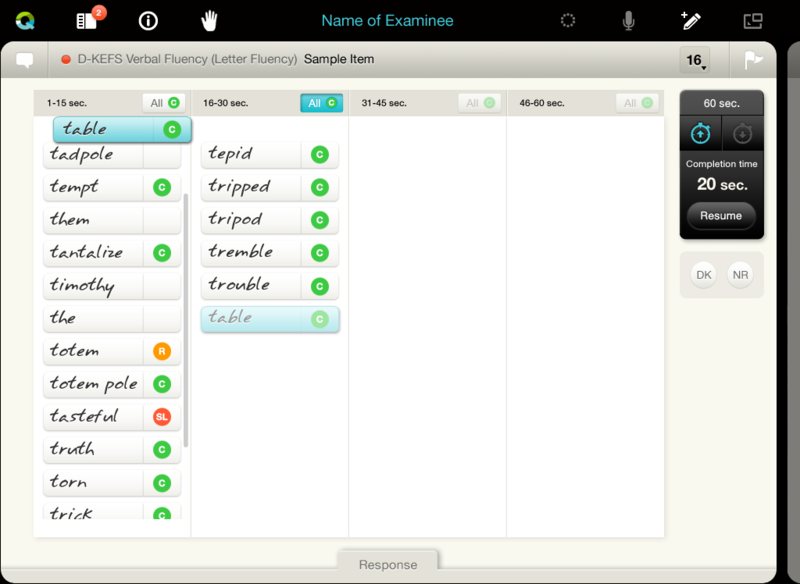 VF measures multiple aspects of verbal behavioural productivity and cognitive flexibility. It evaluates effectiveness of novel and semantic search strategies, and assesses flexibility in the implementation of semantic search strategies. The process approach enables further evaluation of self-monitoring of information search, as well as difficulties related to initiation and sustaining effort. 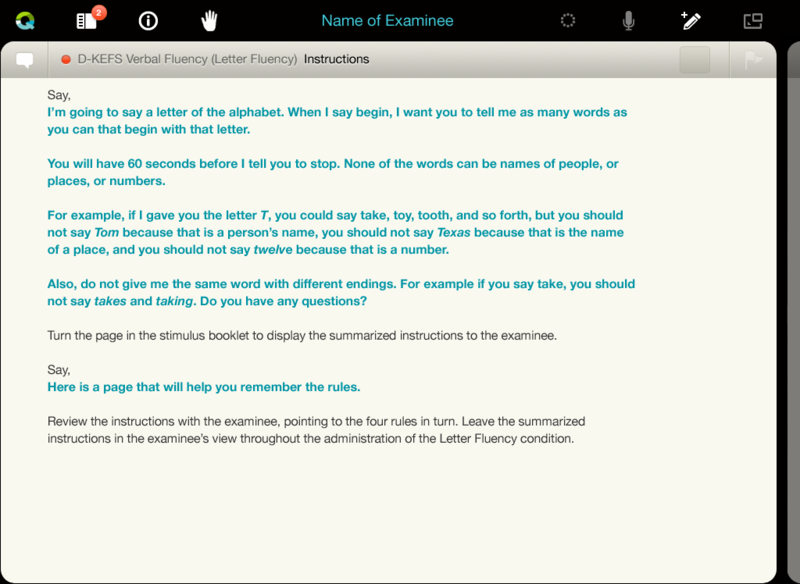 There are three conditions in the VF test in which the examinee must say as many words as they can by letter, category, and category switching prompts. DF measures multiple aspects of visual behavioural productivity and cognitive flexibility. DF evaluates visual productivity with and without distracting stimuli, and switching between stimuli. The process approach is used to assess for difficulties with self-monitoring of performance for rule-adherence, and redundant responding. There are three conditions in the DF test in which the examinee attempts to produce as many novel designs as possible using filled, empty, or switching between filled and empty dots. The examinee completes this test using a response booklet, and not on his or her digital device. CWIT measures inhibitory control and cognitive flexibility. The CWIT utilises the “Stroop Effect” to identify deficits in inhibition of over-learned behaviours. In addition to standard colour naming, word reading, and colour-word interference trials, the CWIT has an additional trial requiring the examinee to switch between inhibitory and non-inhibitory responses. Process measures enable assessment of general difficulties. The examinee completes this test using the same stimulus booklet as on the traditional administration, and not on his or her digital device.